My name is Jura Afanasjevs. 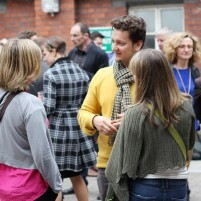 Originally from Latvia, I am multidisciplinary designer, currently living and working in Dublin. This website is a place to learn, a place to experiment and to grow professionally. I started my professional career in design with master degree in Critical studies from Latvian University on a background and Bachelor 1st Honours degree in Visual Communication from DIT, Ireland. My achievements so far have only fuelled up my desire to succeed. I received a Merit from International Society of Typographic Designers and the Best Student of Visual Communication awarded by Dynamo; also I was awarded the Three x 3 internship which commences in October, 2014. Having vast experience working as print designer in cultural sphere from concept to production, I have also participated in web design and animation projects as a freelancer or in a team. I share the believe in simplicity and clear message and also that a design process should be analytical, strategic as well as creative. It draws me into exploring our culture, testing technologies, and investigating new ways of communication. With a focus on creative approach, I see design as an instrument for communication of social, cultural and technological trends. Also in my view, experiments and failure have essential part in any practice. It gives better understanding of design process, as well as a fresh outlook on things around us.